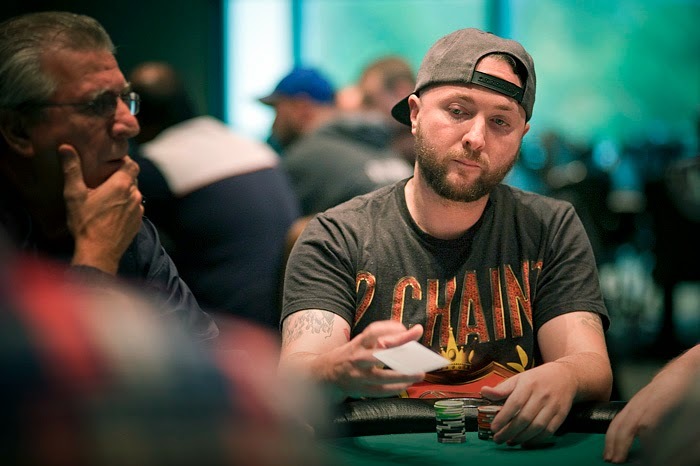 Jason Calnan came into the chip lead and never looked back. His solid place and timely aggression led him to a top prize of $22,619 and his SECOND globe of the week! Farris ran his [3c][3h] into the [As][Ah] of Calnan and did not improve. Farris will take home $14,000 for his deep run here in Event 15! Tarun G was all in and at risk for his last 115,000 with [Qh][9h] against the [As][2c] of Jay Calnan. Tarun did not improve and is heading home in 3rd place. The players did agree to a save so Tarun and Farris both will take home $14,000, Jay Calnan is taking home $19,000 and they are playing for the remaining $3,600 and the globe! 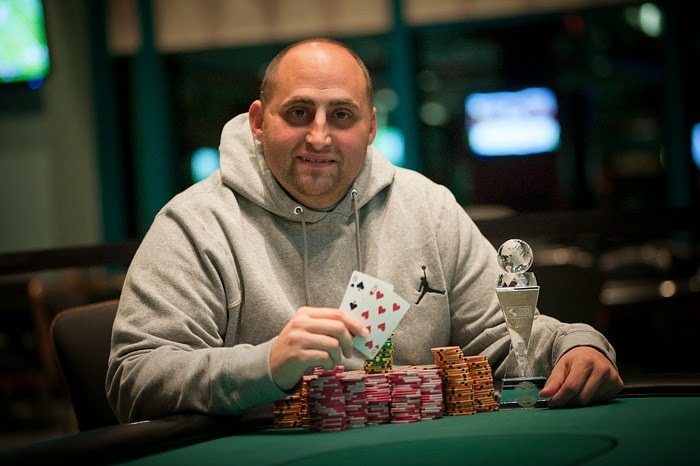 Nick Palma was all in and at risk holding [Kh][10c] against the [9d][9c] of Jay Calnan. "I have 172,000" Palma said looking up at Calnan. The dealer spread the [3h][9s][5c] flop. "Give me em'!" Yelled Calnan. The turn was the [9h] as the rail let out a bunch of ohs and Palma was drawing dead and the river was a meaningless [Ah] hit the river. Palma will take home $7,938 for his 4th place finish. Timothy O'Neil was in great shape to double up as he found all of his chips in the middle with [Kc][Ks] against the [Ah][Kd] of Michael Farris. The dealer spread the [Ac][2d][3h] flop and O'Neil went from a huge favorite to a huge dog and would need to catch the case king to take the pot down. The board ran out [8s][5c] and O'Neil is sent home in 5th place good for $5,976. Players are now back from dinner. Blinds are 6,000/12,000 with a 2,000 ante. 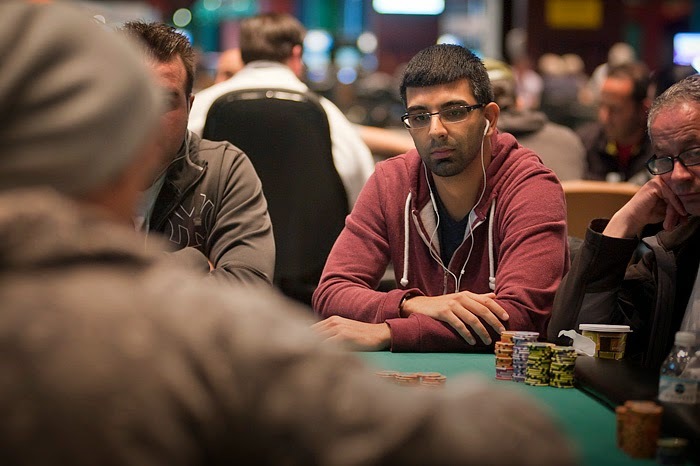 Tarun G just doubled up through Nick Palma right before dinner break. Tarun is now 243,000 and Palma has dropped to 210,000. Players are now on their 60 minute dinner break. Play will resume at 7:03pm. All eyes in the tournament area shifted to the feature table after Michael Farris let out a long list of expletives and almost punched a hole through the table. 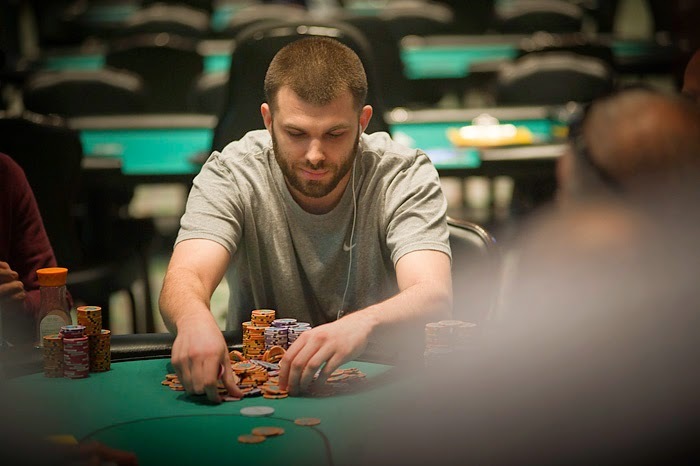 It all started with Nick Palma opening the action pre-flop and barreling on the flop and turn of the [3h][Qc][Qs][7s] board. The [Jh] hit the river and Nick Palma checked to Farris. Farris pushed out a pile of red chips good for a bet of 100,000. "How much?" Palma asked with a tone of disgust, "I call." Farris confidently tabled the [6c][6s] and Palma flipped over [Jd][9s] and would take down the pot of over 300,000. This sparked an outburst of cursing, obscene gestures, and anger from Farris to which the entire table was entertained. He has cooled down since, but is still visibly aggravated. Palma now sits with 400,000 and Farris is back down to around 200,000. Players will be heading on their 60 minute dinner break in 8 minutes. Gerald Aiello was down to his last chip and was all in with [8c][8d] but the board unfortunately ran out all hearts and he would be eliminated. Gerald will take home $4,780 for his run. Michael Spanos is headed home in 7th place. 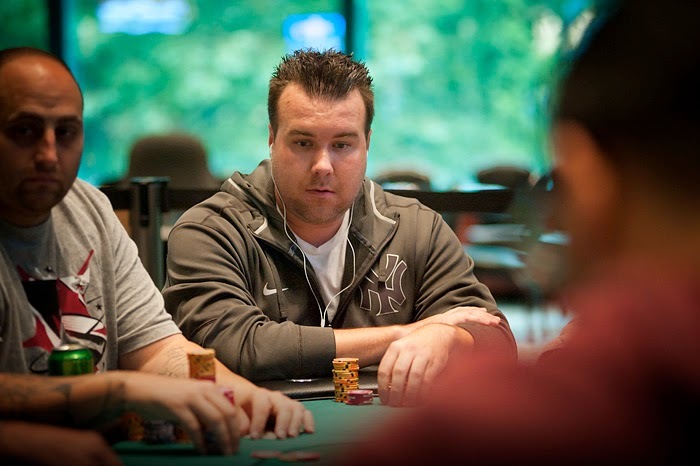 Spanos will collect $3,926 for his deep run here in event 15! 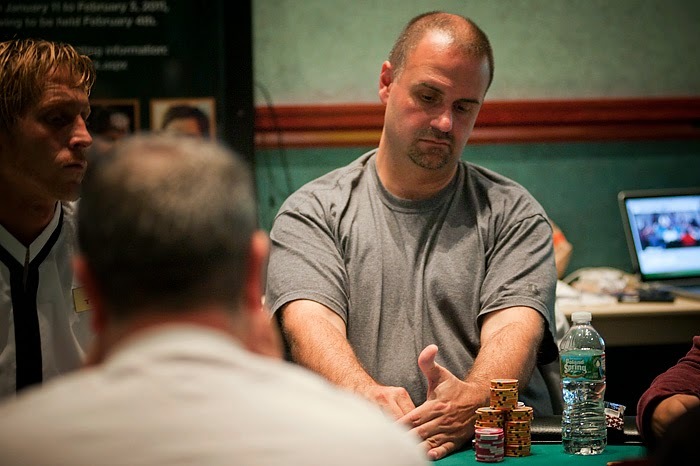 Mark Perry was all in and at risk for his last 6 big blinds with [As][6h] against the [Kd][Jd] of Jason Calnan. The board ran out [3h][5s][Ks][6d][8h] and Perry was sent home in 8th place. Leaving us in 9th place is Jeffrey Perzano . Perzano was all in and at risk with [As][6s] against the [Ks][5s] of Timothy O'Neil on a [9d][7s][Qs] board. The [3d] was a good card for Perzano but O'Neil spiked a [5d] on the river to send Perzano home. Perzano will take home $2,560 and the remaining 8 players are guaranteed $3,159. This is a one day event so we will be playing down to a winner tonight! Palma rakes in a huge pot. 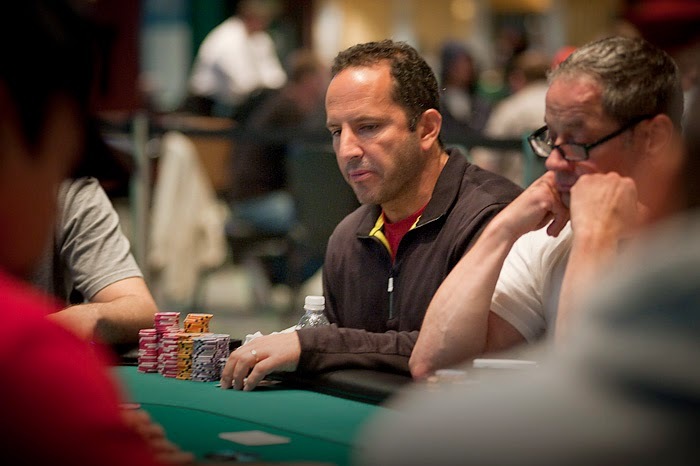 Action folded around to Nick Palma in the small blind who raised to 14,000. 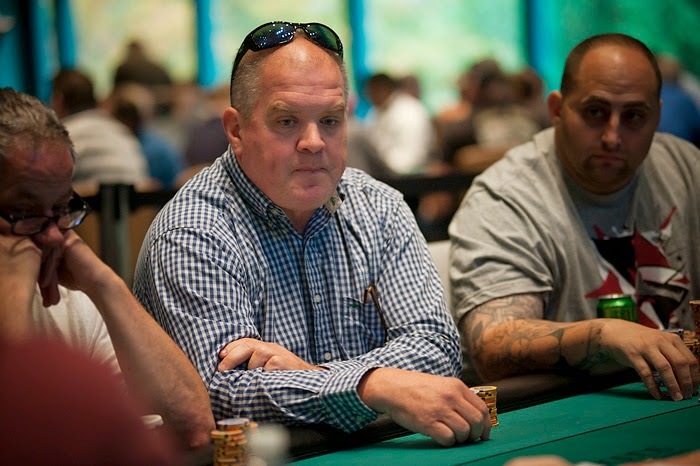 Michael Farris reraised from the big blind to 35,000 only to have Palma click it back with a four-bet to 62,500. Farris flatted and we were heads up to the flop. Palma lead for 32,000 and Farris quickly raised to 65,000. Palma counted out chips and eventually pushed in a call. Both players checked the [Kd] turn and things would heat up as the dealer peeled the [Jh] on the river. Palma announced he was all in as Farris dropped the chips he was shuffling and sat back in his chair. "This is so sick!" He said to himself as he started counting down his stack. 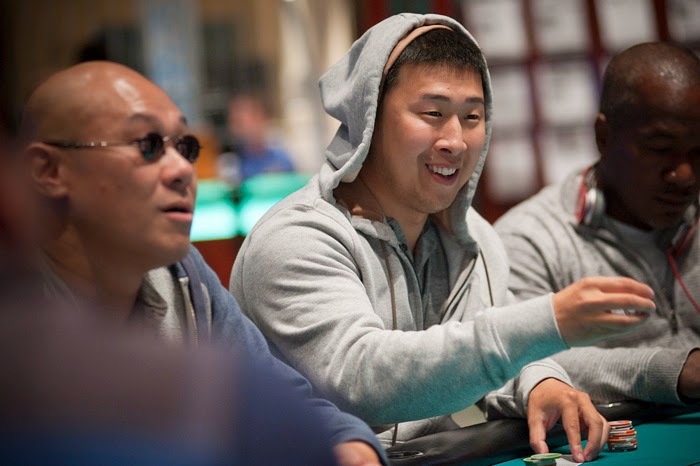 After a minute or so he folded and Palma scooped a monster pot, putting himself over the 300,000 chip mark. We say goodbye to Jacob Pigeon in 10th place. Pigeon got the last of his chips in the middle with [9s][9h] against the [Kc][Kd] of Tarun G and was unable to improve. Pigeon will take home $2,134 for his final table finish in event 15. 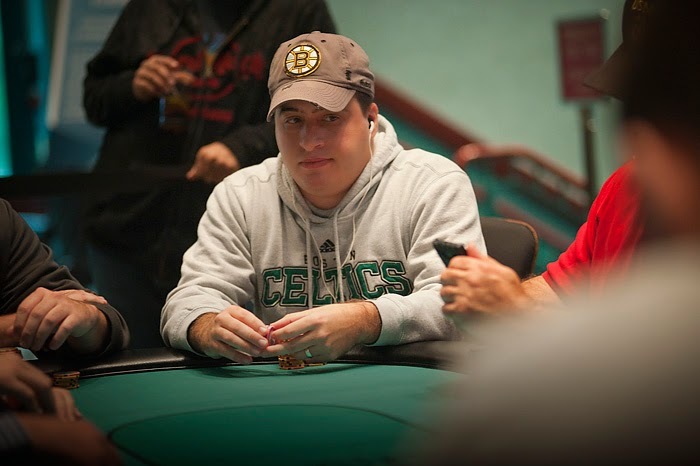 Palma is at it again as he has busted the bubble in event 15. John Doe was all in for his last 30,000 and in great shape to double. The board ran out [3d][4c][4h][7s][Ks] and Doe was sent home as the bubble boy. Players will be redrawing when we reach the final 10. All day there has been constant chirping between John Doe and Nick Palma. In the latest development Doe checked his action to Palma on the [8h][Qd][9c][7s] board. 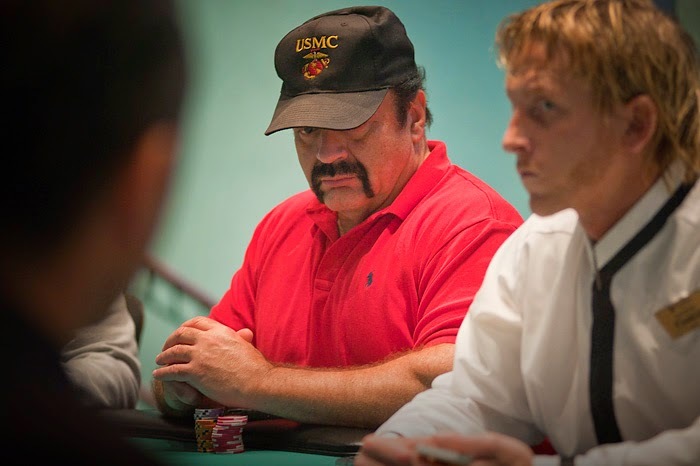 Palma slid forward a stack of red 5,000 chips and announced all in. Doe sat back in his chair and crossed his arms, visibly frustrated. He counted out his remaining chips and eventually released his hand. The banter continued after the hand but the table remains in high spirits laughing and joking with each other. We are down to 13 players which now means we are officially on the money bubble. 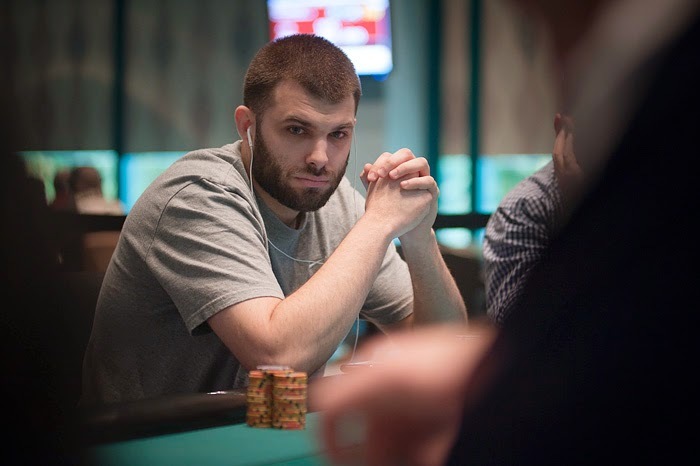 The first hand back from break Mark Perry found himself all in and at risk against Tarun G. Perry shoved his last 48,000 from the button and Tarun called from the small blind. Things looked grim for Perry as the flop provided no help with the [3d][2h][5c]. The [6d] on the turn was another brick for Perry, but he would catch the [Kc] on the river and double up to 104,000. Perry and Tarun discuss the hand. Mark Perry led out for 11,000 on the [8d][7d][8s][4d] into Tarun G. After a few seconds Tarun grabbed two towers of orange and slid them into the middle for a raise of 24,500. Perrry went deep into the tank but eventually would release his hand. "Two Nines?" Palma questioned from across the table. Tarun tabled the [9h][9s] and Palma continued with "Man I am so sick. I just know where everyone is at!" Perry and Tarun continued to discuss the hand and Perry said he had a big diamond. Tarun is up to 156,000 and Perry is back down to 52,000. We also just saw Will "The Thrill" Failla take his seat. Registration/Reentry is open until the end of level 9! After doubling up Tarun G, Tim Reilly was left with only 30,700 and he pushed all of it into the middle from the hi-jack. Mark Perry isolated from the cut-off and the action folded through the blinds. The board ran out [6s][Kh][9d][9c][4c] and despite picking up counterfeit outs on the turn, Reilly could not improve and would be sent home in 15th place. Perry is up to 105,000. Tim Reilly opened the action with a raise to 7,500 from the hi-jack and action folded around to Tarun G in the small blind. 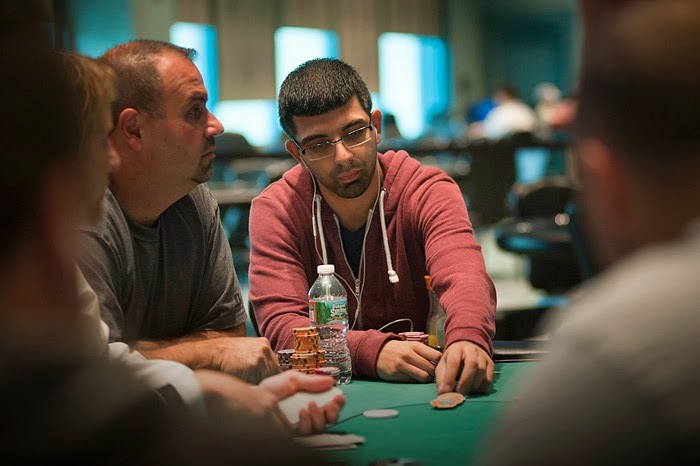 Tarun counted down his stack a few times before grabbing three red 5,000 chips and putting in a three-bet to 15,000 leaving himself 35,000 behind. After asking for Tarun for a count, Reilly announced all in and was snap called by Tarun. Tarun nodded his head and tabled the [Kd][Kc] as Reilly flipped over [7c][7d]. "Sorry for hitting the 7 bud!" Reilly said with a smile, but would have no such luck as the board ran out [3h][Qc][3s][Kh][Jh]. Tarun now sits with 107,000 and Reilly is now the short stack sitting on only 32,000. 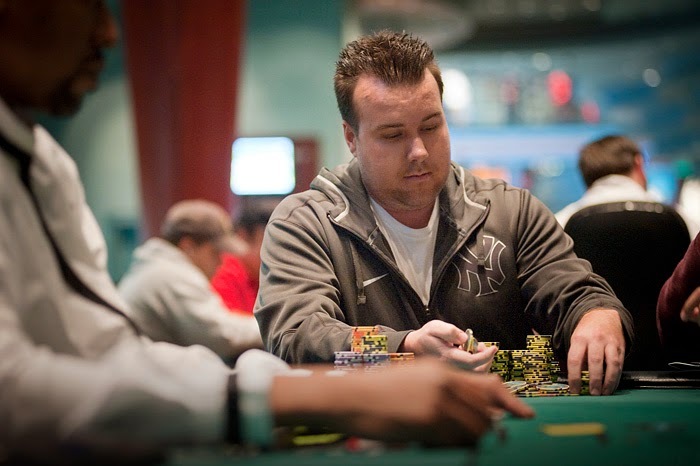 Event 15: Palma, Reilly, Tarun, and Perry Join Feature Table as Day 2 Begins! Day 2 is underway in event 15! 17 players have taken their seat to battle it out for the $23,901 top prize. 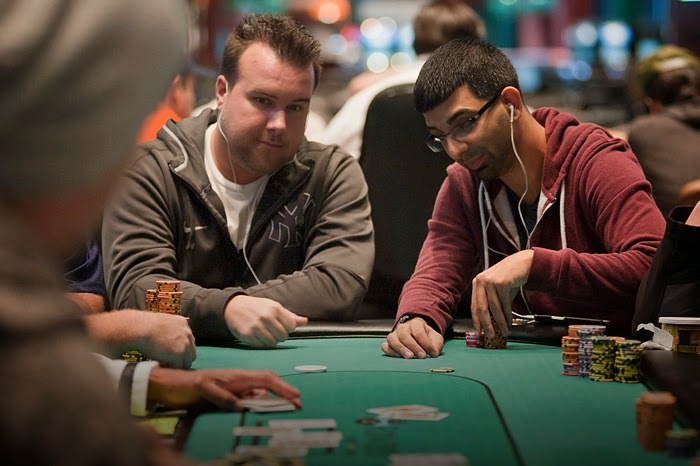 Among those 17, Timothy Reilly, Tarun G, Nick Palma, and Mark Perry have all drawn the feature table to start the day. Follow along live at www.foxwoodslive.com ! Day 2 @FoxwoodsPoker $1100 at 12pm. On the feature table with @TimReillyPoker @nicholas_palma & @Perrym316! Watch on http://t.co/9nc4jiYW5J. Event 17: $400 NLH Big Stack Bounty Semi-Turbo is Under Way! Event 17 is officially underway. So far 89 players have taken their seat in today's bounty. This is a one day event and we are scheduled to play down to a winner! Players start with 30,000 in chips and a $100 bounty on each of their heads.